To understand the purpose and importance of MEDICA, here's a little background on institutional repositories or IRs. What is an institutional repository and why is it important? 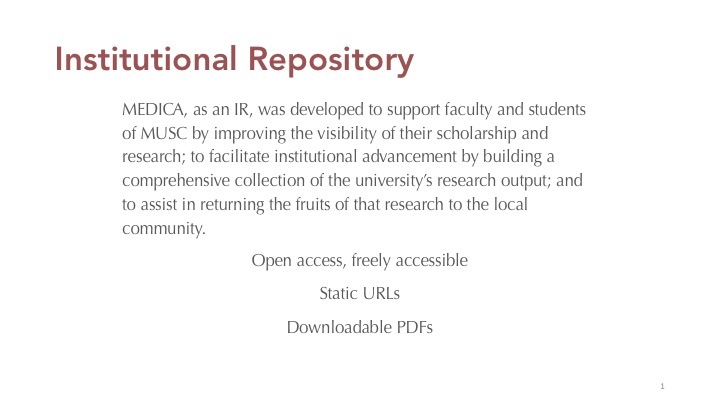 An institutional repository (IR) has been defined as "digital collections capturing and preserving the intellectual output of a single or multi-university community. "1 Creating and maintaining an IR can be significant for an institution because IR's help to provide online access to and preserve the research and scholarly works produced by an institution's faculty and students. IR's help to build and preserve a comprehensive landscape of a university's research output to highlight the skills and programs developed and produced by the university's faculty and students. Registration – by depositing in the repository the researcher would make claim to their discovery. Awareness – by constructing the repository to internationally agreed standards the institution would ensure that the researcher’s work would be found by search engines and available to their peers. 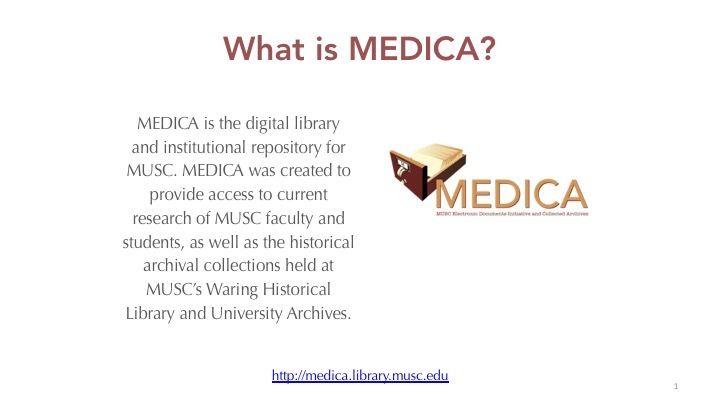 Thus, MEDICA allows MUSC to preserve and provide access to its research output, while broadening the visibility of its scholarly works of its faculty and students. Sustained growth of MEDICA may also have benefits for employee and student recruitment, giving, and encourage intercollegiate and inter-professional collaboration. By contributing your work, you help to increase the value of MUSC's academic enterprise among its peers. MEDICA encourages MUSC faculty and students to upload their articles, dissertations, and other scholarly works for inclusion in the digital repository. Uploading your work to MEDICA is easy--just add your files to the Upload Form.